“What are those things called? Crutters?” Oh. I wish. I’m pretty sure the woman in the elevator at work was asking her friend about Cronuts but I kept to myself. No one likes a know-it-all who wasn’t a part of the conversation in the first place. Do you think Cronuts, the croissant doughnut hybrid by Dominique Ansel, would be as popular if they were called Crutters? The thought made me giggle all the way down the hallway to my office and a little laugh is always a good way to start the day. I haven’t tasted a Cronut. We live near Dominque Ansel Bakery but I can’t face the extraordinary line. From what I know of the chef, I'm sure that they’re absolutely worth the commotion. At the very least, they deserve hype for creating hype. When was the last time a dessert did that? Impressive. After culinary school, I knew I wanted to be working as a food editor in a magazine test kitchen. It’s a perfect job for me and I still love it (almost) every single day. But some years back, while working at my first magazine job, I wondered if maybe I should check out the restaurant world. A friend got me a meeting with Chef Ansel and I asked if I could be of any use to him on the weekends. He invited me to work (for free, of course) in his pastry kitchen at Daniel and I joined the team as a stagiaire (a cooking intern/peon) on 12-hour Saturday shifts. I was happy to do whatever they needed done which often meant cleaning out the walk-in fridge or washing the silpats. A never ending pile of a billion, trillion, million silpats. Every once in a while, someone nice with way more to do than hours to do it in, would take a moment to stop and teach me something. How to be more efficient with a pastry bag, a trick for tempering chocolate, and how bring a broken batter back to life with a blow torch among many other little things. I really appreciated that. Well...that and the fact that when pastries aren’t perfect at Daniel, they aren’t served in the restaurant. Imagine all the delicious rejects that made their way into my belly! I still dream about the gorgeous and extremely delicate chocolate soufflé –like cakes that were filled with bittersweet salted caramel. They were baked in ring molds and had to be unmolded warm. Sometimes the temperamental beauties would break as we pulled them out and the only thing to do was to stuff them directly into our faces before any of the molten caramel could be lost. Holy. Moly. (Thank goodness my checkered chef pants had an elastic waistband.) Dreaming of that caramel helps me forget about the day that I smashed a hot sheet pan into my face and burned a very attractive line across my cheek. (How is that even possible?) Graceful is something I will never be. Don't worry - it was far more embarrassing than it was painful. I ended up leaving Daniel after a few months when I got a new magazine job outside of New York. I’ll always be grateful for the opportunity to crash their pastry party for a while. It was definitely a good one. So these chocolate chip macaroon bars have nothing to do with croissants, doughnuts, or Cronuts but they are inspired by Chef Ansel and his brilliance. He put together two fantastic things and came out with something new and special. Why don’t we all do that more often? (I would kill to visit a spa that also had puppies roaming about.) This week, I took two desserts that I could eat every day - chocolate chip cookies and coconut macaroons - and put them together. It’s not brain surgery but it’s pretty smart. 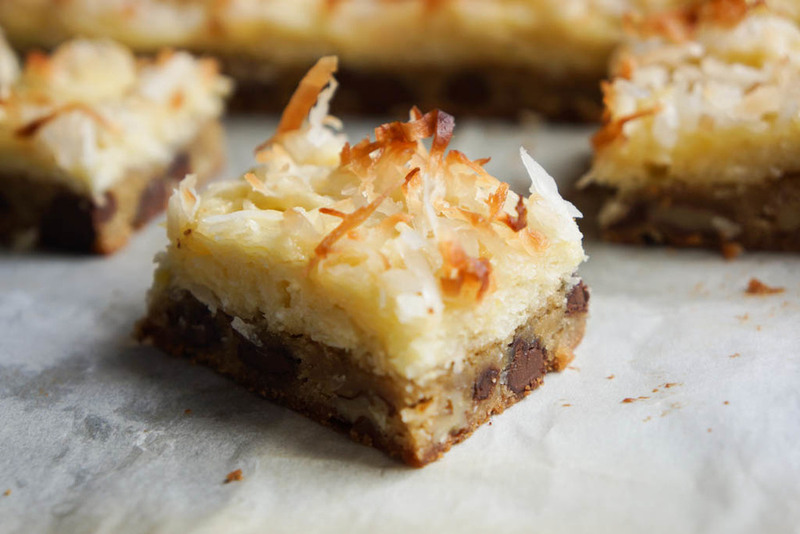 Warm, chewy chocolate chip cookie bar covered in rich, sweet, coconut clouds. I doubt I have too much convincing to do. Hey maybe I should call them Crutters? 1. Preheat oven to 375°. Line an 9-inch-9-inch baking pan with parchment, leaving 2-inch overhang. 2. Make the cookie base: In a small bowl, whisk together flour, baking powder, and salt. In a medium bowl, with an electric mixer, beat together butter, granulated sugar, and brown sugar until fluffy, 2 minutes. Add egg and vanilla and beat to combine. Add flour mixture to butter mixture and beat until combined. Fold in chocolate and pecans. Spread into prepared pan and bake until light golden and just set, 13 to 15 minutes. 3. Meanwhile make the macaroon top: In a medium bowl, whisk together eggs, sugar, salt, and vanilla. Add flour and all but 1/2 cup coconut and stir to combine. Right when the cookie base comes out of the oven, spread coconut mixture evenly over the top (wet your fingers with a little water to make the job easier). Sprinkle top with reserved coconut. Bake until golden brown and set, about 20 minutes. Let cool in pan on a wire rack. Using the parchment, lift cookie out of pan, transfer to a cutting board, and cut into bars.